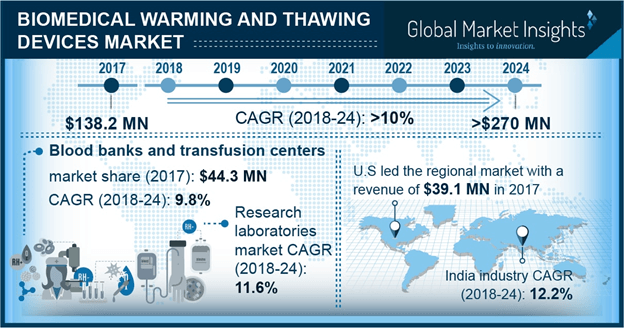 Biomedical Warming and Thawing Devices Market size is set to exceed USD 270 million by 2024; according to a new research study published by Global Market Insights, Inc.
Increasing incidence of road accidents and trauma cases that require blood transfusions will drive the growth of global biomedical warming and thawing devices market. Furthermore, growing demand for in-vitro fertilization and artificial insemination processes due to rising incidence of infertility will also propel the market growth in the long run. Developing countries such as India, China, Mexico opt for in-vitro fertilization due to which the application of thawing devices has only increased. North America has the largest share in the global biomedical warming and thawing devices owing to the presence of numerous blood banks and centers as well as strong government support. Constantly growing government initiatives in the U.S. has aided for the development of medical devices sector by providing superior quality products, hence fostering the market growth. These mentioned factors will boost the growth opportunities for biomedical warming and thawing devices market. Strict regulations related to thawed biomedical products and samples is one of the factors responsible for impeding the biomedical warming and thawing devices market growth over the projection years. In addition, issues related to large batch size is another hindrance, that might hamper the demand of thawing devices, thereby restraining the industry growth. Automatic biomedical warming and thawing devices market segment is anticipated to experience robust growth in foreseeable future, accounting for USD 46.9 million in 2017. Multiple detection mechanisms, vial temperature determination, phase change initiation and thaw completion are few of the advantageous factors driving the growth of automatic biomedical warming and thawing devices market segment. Blood products market segment is expected to grow at 10.1% during the projected years from 2018-2024. Increasing number of road accidents and trauma cases, and presence of various blood banks and storage centers globally will propel the growth of blood products market segment. Furthermore, greater demand for biomedical research are few of the major factors responsible for the growth of blood products market segment. Ovum/embryo market segment accounted for USD 30.3 million in 2017. The market share is attributed to increasing incidence of infertility and better technological advancement in the field of in-vitro fertilization. Increasing use of thawed embryo sample for frozen embryo transfer is also increasing the application of thawing equipment in hospitals and clinics, hence propelling the growth of ovum/embryo market segment. Blood banks and transfusion centers market segment in anticipated to expand at a CAGR of 9.8% during the forecast timeframe. Factors such as increase in number of blood banks and transfusion centers that supply frozen plasma, whole blood cells, red blood cells, etc. to hospitals and surgical centers for transfusion processes will boost the demand for warming and thawing devices. U.S. biomedical warming and thawing devices market is estimated to grow at a CAGR of around 9.6% over the forecast period. There are a lot of large number of blood banks and transfusion centers in the U.S. that supply frozen plasma and whole blood cells to hospitals and critical care centers. According to the American National Red Cross, approximately 36,000 units of red blood cells are needed every day in the U.S. All these factors will enhance industry growth in the U.S.
Germany dominated the Europe biomedical warming and thawing devices market with a market value of USD 7.1 million in 2017. Presence of large base of target population, and availability of technologically advanced manufacturing capabilities are the highest impact-rendering drivers in Germany. Germany is one of the major contributors to the European regional market for biomedical warming and thawing devices. Prominent industry players include include Helmer Scientific, BioCision, Sartorius AG, Sarstedt AG & Co. KG, Boekel Scientific, Barkey, CytoTherm, Cardinal Health, GE Healthcare, Thermo Fisher Scientific. These market players have adopted innovative strategies such as new product development, improving their manufacturing footprint, merger and acquisition, and geographical expansion for improving their position in the market place.